We were the first to talk about Cosmoledoin September 2011, an atypical 33.08 metre sailing yacht (40.47m with her impressive bowsprit) under construction at Alu Marine, France. The yard has now confirmed her launch. Designed by Geronimo Naval Design and the in-house architects, this privately-owned ketch built in aluminum will be based in the Seychelles for oceanographic exploration and television production in the Indian Ocean, a role reminiscent of Cousteau’s Calypso. Designed to be an explorer, Cosmoledo will remain far from harbours during long cruises. That’s why she was designed with a voluminous engine room, easy for maintenance, and a large stowage area for supplies. Her interior layout will accommodate 10 passengers including a small crew. The rig, comprising two masts of 35 and 25 metres, is currently installed. It will give a total sail area of 514 square metres, and in case of light wind, twin 294kW engines will give a cruising speed of 11 knots. 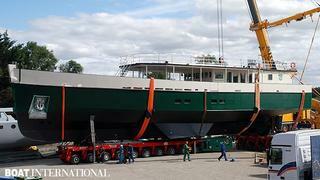 Cosmoledo will start her sea trials soon, and Alu Marine has already promised us more pictures of the yacht under sail. Her delivery is scheduled for the end of the year.